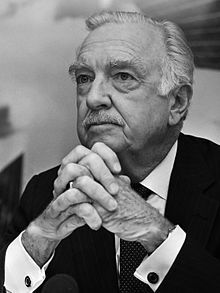 Walter Leland Cronkite Jr. (November 4, 1916 – July 17, 2009) was an American broadcast journalist who served as anchorman for the CBS Evening News for 19 years (1962–1981). During the heyday of CBS News in the 1960s and 1970s, he was often cited as "the most trusted man in America" after being so named in an opinion poll. He reported many events from 1937 to 1981, including bombings in World War II; the Nuremberg trials; combat in the Vietnam War; the Dawson's Field hijackings; Watergate; the Iran Hostage Crisis; and the assassinations of President John F. Kennedy, civil rights pioneer Martin Luther King Jr., and Beatles musician John Lennon. He was also known for his extensive coverage of the U.S. space program, from Project Mercury to the Moon landings to the Space Shuttle. He was the only non-NASA recipient of an Ambassador of Exploration award. Cronkite is well known for his departing catchphrase, "And that's the way it is," followed by the date of the broadcast. Cronkite was born on November 4, 1916, in Saint Joseph, Missouri, the son of Helen Lena (née Fritsche) and Dr. Walter Leland Cronkite, a dentist. Cronkite lived in Kansas City, Missouri, until he was ten, when his family moved to Houston, Texas. He attended elementary school at Woodrow Wilson Elementary School, junior high school at Lanier Junior High School (now Lanier Middle School) and high school at San Jacinto High School, where he edited the high school newspaper. He was a member of the Boy Scouts. He attended college at the University of Texas at Austin (UT), entering in the Fall term of 1933, where he worked on the Daily Texan and became a member of the Nu chapter of the Chi Phi Fraternity. He also was a member of the Houston chapter of DeMolay, a Masonic fraternal organization for boys. While attending UT, Cronkite had his first taste of performance, appearing in a play with fellow student Eli Wallach. He dropped out in 1935, not returning for the Fall term, in order to concentrate on journalism. He dropped out of college in his junior year, in the fall term of 1935, after starting a series of newspaper reporting jobs covering news and sports. He entered broadcasting as a radio announcer for WKY in Oklahoma City, Oklahoma. In 1936, he met his future wife, Mary Elizabeth "Betsy" Maxwell, while working as the sports announcer for KCMO (AM) in Kansas City, Missouri. His broadcast name was "Walter Wilcox". He would explain later that radio stations at the time did not want people to use their real names for fear of taking their listeners with them if they left. In Kansas City, he joined the United Press in 1937. He became one of the top American reporters in World War II, covering battles in North Africa and Europe. With his name now established, he received a job offer from Edward R. Murrow at CBS News to join the Murrow Boys team of war correspondents, relieving Bill Downs as the head of the Moscow bureau. CBS offered Cronkite $125 ($2,189 in 2018 money) a week along with "commercial fees" amounting to $25 ($438 in 2018) for almost every time Cronkite reported on air. Up to that point, he had been making $57.50 ($1,006 in 2018) per week at UP, but he had reservations about broadcasting. He initially accepted the offer. When he informed his boss Harrison Salisbury, UP countered with a raise of $17.50 ($306 in 2018) per week; Hugh Baillie also offered him an extra $20 ($350 in 2018) per week to stay. Cronkite ultimately accepted the UP offer, a move which angered Murrow and drove a wedge between them that would last for years. Cronkite was on board USS Texas (BB-35) starting in Norfolk, Virginia, through her service off the coast of North Africa as part of Operation Torch, and thence back to the US. On the return trip, Cronkite was flown off Texas in one of her OS2U Kingfisher aircraft when Norfolk was within flying distance. He was granted permission to be flown the rest of the distance to Norfolk so that he could outpace a rival correspondent on USS Massachusetts (BB-59) to return to the US and to issue the first uncensored news reports to published about Operation Torch. Cronkite's experiences aboard Texas launched his career as a war correspondent. Subsequently, he was one of eight journalists selected by the United States Army Air Forces to fly bombing raids over Germany in a B-17 Flying Fortress part of group called the Writing 69th, and during a mission fired a machine gun at a German fighter. He also landed in a glider with the 101st Airborne in Operation Market Garden and covered the Battle of the Bulge. After the war, he covered the Nuremberg trials and served as the United Press main reporter in Moscow from 1946 to 1948. In 1950, Cronkite joined CBS News in its young and growing television division, again recruited by Murrow. Cronkite began working at WTOP-TV (now WUSA), the CBS affiliate in Washington, D.C.. He originally served as anchor of the network's 15-minute late-Sunday-evening newscast Up To the Minute, which followed What's My Line? at 11:00 pm ET from 1951 through 1962. Although it was widely reported that the term "anchor" was coined to describe Cronkite's role at both the Democratic and Republican National Conventions, marking the first nationally televised convention coverage, other news presenters bore the title before him. Cronkite anchored the network's coverage of the 1952 presidential election as well as later conventions. In 1964 he was temporarily replaced by the team of Robert Trout and Roger Mudd; this proved to be a mistake, and Cronkite returned to the anchor chair for future political conventions. From 1953 to 1957, Cronkite hosted the CBS program You Are There, which reenacted historical events, using the format of a news report. His famous last line for these programs was: "What sort of day was it? A day like all days, filled with those events that alter and illuminate our times ... and you were there." In 1971, the show was revived and redesigned to attract an audience of teenagers and young adults, hosted again by Cronkite on Saturday mornings. In 1957, he began hosting The Twentieth Century (eventually renamed The 20th Century), a documentary series about important historical events of the century composed almost exclusively of newsreel footage and interviews. A long-running hit, the show was again renamed as The 21st Century in 1967 with Cronkite hosting speculative reporting on the future for another three years. Cronkite also hosted It's News to Me, a game show based on news events. During the presidential elections of 1952 and 1956 Cronkite hosted the CBS news-discussion series Pick the Winner. Another of his network assignments was The Morning Show, CBS' short-lived challenge to NBC's Today in 1954. His on-air duties included interviewing guests and chatting with a lion puppet named Charlemane about the news. He considered this discourse with a puppet as "one of the highlights" of the show. He added, "A puppet can render opinions on people and things that a human commentator would not feel free to utter. I was and I am proud of it." Cronkite also angered the R. J. Reynolds Tobacco Company, the show's sponsor, by grammatically correcting its advertising slogan. Instead of saying "Winston tastes good like a cigarette should" verbatim, he substituted "as" for "like." He was the lead broadcaster of the network's coverage of the 1960 Winter Olympics, the first-ever time such an event was televised in the United States. He replaced Jim McKay, who had suffered a mental breakdown. A title card still from the April 4, 1968 edition of the CBS Evening News with Walter Cronkite, the evening of the assassination of Martin Luther King Jr..
On April 16, 1962, Cronkite succeeded Douglas Edwards as anchorman of the CBS's nightly feature newscast, tentatively renamed Walter Cronkite with the News, but later the CBS Evening News on September 2, 1963, when the show was expanded from 15 to 30 minutes, making Cronkite the anchor of American network television's first nightly half-hour news program. Cronkite's tenure as anchor of the CBS Evening News made him an icon in television news. During the early part of his tenure anchoring the CBS Evening News, Cronkite competed against NBC's anchor team of Chet Huntley and David Brinkley, who anchored the Huntley-Brinkley Report. For much of the 1960s, the Huntley-Brinkley Report had more viewers than Cronkite's broadcast. A key moment for Cronkite came during his coverage of John F. Kennedy's assassination on November 22, 1963. Another factor in Cronkite and CBS' ascendancy to the top of the ratings was that, as the decade progressed, RCA made a corporate decision not to fund NBC News at the levels that CBS provided for its news broadcasts. Consequently, CBS News acquired a reputation for greater accuracy and depth in coverage. This reputation meshed well with Cronkite's wire service experience, and in 1967 the CBS Evening News began to surpass The Huntley-Brinkley Report in viewership during the summer months. In 1969, during the Apollo 11 (with co-host and former astronaut Wally Schirra) and Apollo 13 moon missions, Cronkite received the best ratings and made CBS the most-watched television network for the missions. In 1970, when Huntley retired, the CBS Evening News finally dominated the American TV news viewing audience. Although NBC finally settled on the skilled and well-respected broadcast journalist John Chancellor, Cronkite proved to be more popular and continued to be top-rated until his retirement in 1981. One of Cronkite's trademarks was ending the CBS Evening News with the phrase "...And that's the way it is," followed by the date. Keeping to standards of objective journalism, he omitted this phrase on nights when he ended the newscast with opinion or commentary. Beginning with January 16, 1980, Day 50 of the Iran hostage crisis, Cronkite added the length of the hostages' captivity to the show's closing in order to remind the audience of the unresolved situation, ending only on Day 444, January 20, 1981. Cronkite is vividly remembered for breaking the news of the Assassination of John F. Kennedy on Friday, November 22, 1963. Cronkite had been standing at the United Press International wire machine in the CBS newsroom as the bulletin of the President's shooting broke and he clamored to get on the air to break the news as he wanted CBS to be the first network to do so. There was a problem facing the crew in the newsroom, however. There was no television camera in the studio at the time as the technical crew was working on it. Eventually the camera was retrieved and brought back to the newsroom. Because of the magnitude of the story and the continuous flow of information coming from various sources, time was of the essence and the camera would take at least twenty minutes to become operational under normal circumstances. The decision was made to dispatch Cronkite to the CBS Radio Network booth to report the events and play the audio over the television airwaves while the crew worked on the camera to see if they could get it set up quicker. Here is a bulletin from CBS News: in Dallas, Texas, three shots were fired at President Kennedy's motorcade in downtown Dallas. The first reports say that President Kennedy has been seriously wounded by this shooting. ...President Kennedy shot today just as his motorcade left downtown Dallas. Mrs. Kennedy jumped up and grabbed Mr. Kennedy, she called, "Oh no!," the motorcade sped on. United Press [International] says that the wounds for President Kennedy perhaps could be fatal. Repeating, a bulletin from CBS News: President Kennedy has been shot by a would-be assassin in Dallas, Texas. Stay tuned to CBS News for further details. Just before the bulletin cut out, a CBS News staffer was heard saying "Connally too," apparently having just heard the news that Texas Governor John Connally had also been shot while riding in the presidential limousine with his wife Nellie and Mr. and Mrs. Kennedy. CBS then rejoined the telecast of ATWT during a commercial break, which was followed by show announcer Dan McCullough's usual fee plug for the first half of the program and the network's 1:45 pm station identification break. Just before the second half of ATWT was to begin, the network broke in with the bumper slide a second time. In this bulletin Cronkite reported in greater detail about the assassination attempt on the President, while also breaking the news of Governor Connally's shooting. ...President Kennedy was shot as he drove from Dallas Airport to downtown Dallas; Governor Connally of Texas, in the car with him, was also shot. It is reported that three bullets rang out. A Secret Service man has been...was heard to shout from the car, "He's dead." Whether he referred to President Kennedy or not is not yet known. The President, cradled in the arms of his wife Mrs. Kennedy, was carried to an ambulance and the car rushed to Parkland Hospital outside Dallas, the President was taken to an emergency room in the hospital. Other White House officials were in doubt in the corridors of the hospital as to the condition of President Kennedy. Repeating this bulletin: President Kennedy shot while driving in an open car from the airport in Dallas, Texas, to downtown Dallas. Cronkite then recapped the events as they had happened: that the President and Governor Connally had been shot and were in the emergency room at Parkland Hospital, and no one knew their condition as yet. CBS then decided to return to ATWT, which was now midway through its second segment. The cast had continued to perform live while Cronkite's bulletins broke into the broadcast, unaware of the unfolding events in Dallas. ATWT then took another scheduled commercial break. The segment before the break would be the last anyone would see of any network's programming until Tuesday, November 26. During the commercial, the bumper slide interrupted the proceedings again and Cronkite updated the viewers on the situation in Dallas. This bulletin went into more detail than the other two, revealing that Kennedy had been shot in the head, Connally in the chest. Cronkite remained on the air for the next ten minutes, continuing to read bulletins as they were handed to him, and recapping the events as they were known. He also related a report given to reporters by Texas Congressman Albert Thomas that the President and Governor were still alive, the first indication of their condition. At 2:00 EST, with the top of the hour station break looming, Cronkite told the audience that there would be a brief pause so that all of CBS' affiliates, including those in the Mountain and Pacific time zones which were not on the same schedule, could join the network. He then left the radio booth and went to the anchor desk in the newsroom. Within twenty seconds of the announcement, every CBS affiliate except Dallas' KRLD (which was providing local coverage) was airing the network's feed. The camera was finally operational by this time and enabled the audience to see Cronkite, who was clad in shirt and tie but without his suit coat, given the urgent nature of the story. Cronkite reminded the audience, again, of the attempt made on the life of the President and tossed to KRLD news director Eddie Barker at the Dallas Trade Mart, where Kennedy was supposed to be making a speech before he was shot. Barker relayed information that Kennedy's condition was extremely critical. Then, after a prayer for Kennedy, Barker quoted an unofficial report that the President was dead but stressed it was not confirmed. After several minutes, the coverage came back to the CBS newsroom where Cronkite reported that the President had been given blood transfusions and two priests had been called into the room. He also played an audio report from KRLD that someone had been arrested in the assassination attempt at the Texas School Book Depository. Back in Dallas Barker announced another report of the death of the President, mentioning that it came from a reliable source. Before the network left KRLD's feed for good, Barker first announced, then retracted, a confirmation of Kennedy's death. CBS cut back to Cronkite reporting that one of the priests had administered last rites to the president. In the next few minutes, several more bulletins reporting that Kennedy had died were given to Cronkite, including one from CBS's own correspondent Dan Rather that had been reported as confirmation of Kennedy's demise by CBS Radio. As these bulletins came into the newsroom, it was becoming clearer that Kennedy had in fact lost his life. Cronkite, however, stressed that these bulletins were simply reports and not any official confirmation of the President's condition; some of his colleagues recounted in 2013 that his early career as a wire service reporter taught him to wait for official word before reporting a story. Still, as more word came in, Cronkite seemed to be resigned to the fact that it was only a matter of time before the assassination was confirmed. He appeared to concede this when, several minutes after he received the Rather report, he received word that the two priests who gave the last rites to Kennedy told reporters on the scene that he was dead. Cronkite said that report "seems to be as close to official as we can get", but would not declare it as such. Nor did he do so with a report from Washington, DC that came moments later, which said that government sources were now reporting the President was dead (this information was passed on to ABC as well, which took it as official confirmation and reported it as such; NBC did not report this information at all and chose instead to rely on reports from Charles Murphy and Robert MacNeil to confirm their suspicions). From Dallas, Texas, the flash, apparently official: (reading AP flash) "President Kennedy died at 1 p.m. Central Standard Time." (glancing up at clock) 2 o'clock Eastern Standard Time, some 38 minutes ago. (clears throat) Vice President Johnson has left the hospital in Dallas, but we do not know to where he has proceeded; presumably he will be taking the oath of office shortly and become the 36th President of the United States. With emotion still in his voice and eyes watering, Cronkite once again recapped the events after collecting himself, incorporating some wire photos of the visit and explaining the significance of the pictures now that Kennedy was dead. He reminded the viewers that Vice President Johnson was now the President and was to be sworn in, that Governor Connally's condition was still unknown, and that there was no report of whether the assassin had been captured. He then handed the anchor position to Charles Collingwood, who had just entered the newsroom, took his suit coat, and left the room for a while. It is said that the human mind has a greater capacity for remembering the pleasant than the unpleasant. But today was a day that will live in memory and in grief. Only history can write the importance of this day: Were these dark days the harbingers of even blacker ones to come, or like the black before the dawn shall they lead to some still as yet indiscernible sunrise of understanding among men, that violent words, no matter what their origin or motivation, can lead only to violent deeds? This is the larger question that will be answered, in part, in the manner that a shaken civilization seeks the answers to the immediate question: Who, and most importantly what, was Lee Harvey Oswald? The world's doubts must be put to rest. Tonight there will be few Americans who will go to bed without carrying with them the sense that somehow they have failed. If in the search of our conscience we find a new dedication to the American concepts that brought no political, sectional, religious or racial divisions, then maybe it may yet be possible to say that John Fitzgerald Kennedy did not die in vain. That's the way it is, Monday, November 25, 1963. This is Walter Cronkite, good night. I choked up, I really had a little trouble...my eyes got a little wet...[what Kennedy had represented] was just all lost to us. Fortunately, I grabbed hold before I was actually [crying]." And when you finally had to say it's official, the President is dead...pretty tough words in a situation like that. And they were, um, hard to come by. According to historian Douglas Brinkley, Cronkite provided a sense of perspective throughout the unfolding sequence of disturbing events. In mid-February 1968, on the urging of his executive producer Ernest Leiser, Cronkite and Leiser journeyed to Vietnam to cover the aftermath of the Tet Offensive. They were invited to dine with General Creighton Abrams, the commander of all forces in Vietnam, whom Cronkite knew from World War II. According to Leiser, Abrams told Cronkite, "we cannot win this Goddamned war, and we ought to find a dignified way out." We have been too often disappointed by the optimism of the American leaders, both in Vietnam and Washington, to have faith any longer in the silver linings they find in the darkest clouds. They may be right, that Hanoi's winter-spring offensive has been forced by the Communist realization that they could not win the longer war of attrition, and that the Communists hope that any success in the offensive will improve their position for eventual negotiations. It would improve their position, and it would also require our realization, that we should have had all along, that any negotiations must be that – negotiations, not the dictation of peace terms. For it seems now more certain than ever that the bloody experience of Vietnam is to end in a stalemate. This summer's almost certain standoff will either end in real give-and-take negotiations or terrible escalation; and for every means we have to escalate, the enemy can match us, and that applies to invasion of the North, the use of nuclear weapons, or the mere commitment of one hundred, or two hundred, or three hundred thousand more American troops to the battle. And with each escalation, the world comes closer to the brink of cosmic disaster. Cronkite reported on location during the Vietnam War. Following Cronkite's editorial report, President Lyndon Johnson is claimed by some to have said, "If I've lost Cronkite, I've lost Middle America." This account has been questioned by other observers in books on journalistic accuracy. At the time the editorial aired, Johnson was in Austin, Texas attending Texas Governor John Connally's birthday gala and was giving a speech in his honor. In his book This Just In: What I Couldn't Tell You on TV, CBS News correspondent Bob Schieffer, who was serving as a reporter for the Fort Worth Star-Telegram when Cronkite's editorial aired, acknowledged that Johnson did not see the original broadcast but also defended the allegation that Johnson had made the remark. According to Schieffer, Johnson's aide George Christian "told me that the President apparently saw some clips of it the next day" and that "That's when he made the remark about Cronkite. But he knew then that it would take more than Americans were willing to give it." When asked about the remark during a 1979 interview, Christian claimed he had no recollection about what the President had said. In his 1996 memoir A Reporter's Life, Cronkite claimed he was at first unsure about how much of an impact his editorial report had on Johnson's decision to drop his bid for re-election, and what eventually convinced him that the President had made the statement was Bill Moyers, fellow journalist and former aide to Johnson, telling him "The president flipped off the set and said 'If I've lost Cronkite, I've lost Middle America.'" Several weeks later, Johnson, who sought to preserve his legacy and was now convinced his declining health could not withstand growing public criticism, announced he would not seek reelection. During the 1968 Democratic National Convention in Chicago, Cronkite was anchoring the CBS network coverage as violence and protests occurred outside the convention, as well as scuffles inside the convention hall. When Dan Rather was punched to the floor (on camera) by security personnel, Cronkite commented, "I think we've got a bunch of thugs here, Dan." The first publicly transmitted live trans-Atlantic program was broadcast via the Telstar satellite on July 23, 1962, at 3:00 pm EDT, and Cronkite was one of the main presenters in this multinational broadcast. The broadcast was made possible in Europe by Eurovision and in North America by NBC, CBS, ABC, and the CBC. The first public broadcast featured CBS's Cronkite and NBC's Chet Huntley in New York, and the BBC's Richard Dimbleby in Brussels. Cronkite was in the New York studio at Rockefeller Plaza as the first pictures to be transmitted and received were the Statue of Liberty in New York and the Eiffel Tower in Paris. The first segment included a televised major league baseball game between the Philadelphia Phillies and the Chicago Cubs at Wrigley Field. From there, the video switched first to Washington, D.C.; then to Cape Canaveral, Florida; then to Quebec City, Quebec, and finally to Stratford, Ontario. The Washington segment included a press conference with President Kennedy, talking about the price of the American dollar, which was causing concern in Europe. This broadcast inaugurated live intercontinental news coverage, which was perfected later in the sixties with Early Bird and other Intelsat satellites. General of the Army Dwight D. Eisenhower returned to his former Supreme Headquarters Allied Expeditionary Force (SHAEF) headquarters for an interview by Cronkite on the CBS News Special Report D-Day + 20, telecast on June 6, 1964. Cronkite is also remembered for his coverage of the United States space program, and at times was visibly enthusiastic, rubbing his hands together on camera with a smile and uttering, "Whew...boy" on July 20, 1969, when the Apollo 11 lunar landing mission put the first men on the Moon. According to the 2006 PBS documentary on Cronkite, there was "nothing new" in his reports on the Watergate affair; however, Cronkite brought together a wide range of reporting, and his credibility and status is credited by many with pushing the Watergate story to the forefront with the American public, ultimately resulting in the resignation of President Richard M. Nixon on August 9, 1974. Cronkite had anchored the CBS coverage of Nixon's address, announcing his impending resignation, the night before. The January 22, 1973 broadcast of the CBS Evening News saw Cronkite break the news of the death of another notable American political figure: former president Lyndon B. Johnson. At approximately 6:38 pm Eastern Time, while a pre-recorded report that the Vietnam peace talks in Paris had been successful was being played for the audience, Cronkite received a telephone call in the studio while off camera. The call was from Tom Johnson, the former press secretary for President Johnson who was at the time serving the former chief executive as station manager at KTBC-TV in Austin, Texas, which was affiliated with CBS at the time and was owned by the Johnson family. During the conversation the production staff cut away from the report back to the live camera in studio as Cronkite was still on the phone. After he was made aware that he was back on camera, Cronkite held up a finger to let everyone watching know he required a moment to let Johnson finish talking. Once Cronkite got what he needed, he thanked Johnson and asked him to stay on the line. He then turned to the camera and began to relay what Johnson had said to him. I'm talking to Tom Johnson, the press secretary for Lyndon Johnson, who has reported that the thirty-sixth President of the United States died this afternoon in a...ambulance plane on the way to San Antonio, where he was taken after being stricken at his ranch- the LBJ Ranch, in Johnson City, Texas. He was stricken at 3:40 pm, Central Standard Time, 4:40...Eastern Standard Time. Three agents who were at the scene, who are permanently attached to the ranch to protect the President, uh, went to his immediate aid, gave him all emergency aid they could, put him in a plane, I suppose, Tom, one of the President's own planes? *pauses to wait for response* Colonel George McGranahan, who was the man who proclaimed the President dead upon arrival at Brook Army General Hospital, at San Antonio. *pauses again* And Mrs. Johnson was notified of the events at her office in Austin and flew immediately to San Antonio and Tom Johnson, no relation to President Johnson, the President's news secretary, has told me that from Austin. During the final ten minutes of that broadcast, Cronkite reported on the death, giving a retrospective on the life of the nation's 36th president, and announced that CBS would air a special on Johnson later that evening. This story was re-told on a 2007 CBS-TV special honoring Cronkite's 90th birthday. NBC-TV's Garrick Utley, anchoring NBC Nightly News that evening, also interrupted his newscast in order to break the story, doing so about three minutes after Cronkite on CBS. The news was not reported on that night's ABC Evening News, which was anchored by Howard K. Smith and Harry Reasoner, because ABC at the time fed their newscast live at 6:00 pm Eastern instead of 6:30 to get a head start on CBS and NBC for those stations that aired ABC Evening News live (although not every affiliate did). On December 10, 1963, Cronkite introduced The Beatles to the United States by airing a four-minute story about the band on CBS Evening News. This was originally broadcast on November 22, 1963, and was going to be shown again on the CBS Evening News, but the assassination of John F. Kennedy prevented the broadcast at that time. On February 14, 1980, Cronkite announced that he intended to retire from the CBS Evening News; at the time, CBS had a policy of mandatory retirement by age 65. Although sometimes compared to a father figure or an uncle figure, in an interview about his retirement he described himself as being more like a "comfortable old shoe" to his audience. His last day in the anchor chair at the CBS Evening News was on March 6, 1981; he was succeeded the following Monday by Dan Rather. On the eve of Cronkite's retirement, he appeared on The Tonight Show hosted by Johnny Carson. The following night, Carson did a comic spoof of his on-air farewell address. As he had promised on his last show as anchor in 1981, Cronkite continued to broadcast occasionally as a special correspondent for CBS, CNN, and NPR into the 21st century; one such occasion was Cronkite anchoring the second space flight by John Glenn in 1998 as he had Glenn's first in 1962. In 1983, he reported on the British General Election for the ITV current affairs series World In Action, interviewing, among many others, the victorious Prime Minister, Margaret Thatcher. Cronkite hosted the annual Vienna New Year's Concert on PBS from 1985 to 2008, succeeded by Julie Andrews in 2009. For many years, until 2002, he was also the host of the annual Kennedy Center Honors. In 1998, Cronkite hosted the 90-minute documentary, Silicon Valley: A 100 Year Renaissance, produced by the Santa Clara Valley Historical Association. The film documented Silicon Valley's rise from the origin of Stanford University to the current high-technology powerhouse. The documentary was broadcast on PBS throughout the United States and in 26 countries. Prior to 2004, he could also be seen in the opening movie "Back to Neverland" shown in the Walt Disney World attraction The Magic of Disney Animation, interviewing Robin Williams as if he is still on the CBS News channel, ending his on-camera time with Cronkite's famous catchphrase. In the feature, Cronkite describes the steps taken in the creation of an animated film, while Robin Williams becomes an animated character (and even becomes Walter Cronkite, impersonating his voice). He also was shown inviting Disney guests and tourists to the Disney Classics Theater. On May 21, 1999, Walter Cronkite participated in a panel discussion on "Integrity in the Media" with Ben Bradlee and Mike McCurry at the Connecticut Forum in Hartford, Connecticut. Cronkite provided a particularly funny anecdote about taking a picture from a house in Houston, Texas, where a newsworthy event occurred and being praised for getting a unique photograph, only to find out later that the city desk had provided him with the wrong address. Cronkite narrated the IMAX film about the Space Shuttle, The Dream is Alive, released in 1985. From May 26, 1986, to August 15, 1994, he was the narrator's voice in the EPCOT Center attraction, Spaceship Earth, at Walt Disney World in Orlando, Florida. He provided the pivotal voice of Captain Neweyes in the 1993 animated film We're Back: A Dinosaur's Story, delivering his trademark line at the end. In 1995, he made an appearance on Broadway, providing the voice of the titular book in the 1995 revival of How to Succeed in Business Without Really Trying. Cronkite was a finalist for NASA's Journalist in Space program, which mirrored the Teacher in Space Project, an opportunity that was suspended after the Challenger disaster in 1986. He recorded voice-overs for the 1995 film Apollo 13, modifying the script he was given to make it more "Cronkitian." In 2002, Cronkite was the voice of Benjamin Franklin in the educational television cartoon Liberty's Kids, which included a news segment ending with the same phrase he did back on the CBS Evening News. His distinctive voice provided the narration for the television ads of the University of Texas, Austin, his alma mater, with its 'We're Texas' ad campaign. Cronkite voiced Tim's grandpa in the BrainPOP episode about aging. He held amateur radio operator license KB2GSD and narrated a 2003 American Radio Relay League documentary explaining amateur radio's role in disaster relief. the video tells Amateur Radio's public service story to non-hams, focusing on ham radio's part in helping various agencies respond to wildfires in the Western US during 2002, ham radio in space and the role Amateur Radio plays in emergency communications. "Dozens of radio amateurs helped the police and fire departments and other emergency services maintain communications in New York, Pennsylvania and Washington, DC," narrator Cronkite intoned in reference to ham radio's response to the terrorist attacks on September 11, 2001. Unusually, Cronkite was a Novice-class licensee—the entry level license—for his entire, and long, tenure in the hobby. On February 15, 2005, he went into the studio at CBS to record narration for WCC Chatham Radio, a documentary about Guglielmo Marconi and his Chatham station, which became the busiest ship-to-shore wireless station in North America from 1914 to 1994. The documentary was directed by Christopher Seufert of Mooncusser Films and premiered at the Chatham Marconi Maritime Center in April 2005. In 2006, Cronkite hosted the World War One Living History Project, a program honoring America's final handful of veterans from the First World War. The program was created by Treehouse Productions and aired on NPR on November 11, 2006. In May 2009, Legacy of War, produced by PBS, was released. Cronkite chronicles, over archive footage, the events following World War II that resulted in America's rise as the dominant world power. Prior to his death, "Uncle Walter" hosted a number of TV specials and was featured in interviews about the times and events that occurred during his career as America's "most trusted" man. In July 2006, the 90-minute documentary Walter Cronkite: Witness to History aired on PBS. The special was narrated by Katie Couric, who assumed the CBS Evening News anchor chair in September 2006. Cronkite provided the voiceover introduction to Couric's CBS Evening News, which began on September 5, 2006. Cronkite's voiceover was notably not used on introducing the broadcast reporting his funeral – no voiceover was used on this occasion. Cronkite made a cameo appearance on a 1974 episode of The Mary Tyler Moore Show, in which he met with Lou Grant in his office. Ted Baxter, who at first tried to convince Cronkite that he (Baxter) was as good a newsman as Eric Sevareid, pleaded with Cronkite to hire him for the network news, at least to give sport scores, and gave an example: "The North Stars 3, the Kings Oh!" Cronkite turned to Grant and said, "I'm gonna get you for this!" Cronkite later said that he was disappointed that his scene was filmed in one take, since he had hoped to sit down and chat with the cast. In the late 1980s and again in the 1990s, Cronkite appeared on the news-oriented situation comedy Murphy Brown as himself. Both episodes were written by the Emmy Award-winning team of Tom Seeley and Norm Gunzenhauser. He also continued hosting a variety of series. In the early 1980s, he was host of the documentary series World War II with Walter Cronkite. In 1991, he hosted the TV documentary Dinosaur! on A&E (not related to the documentary of the same title hosted by Christopher Reeve on CBS six years earlier), and a 1994 follow-up series, Ape Man: The Story of Human Evolution. In 1995, he narrated the World Liberty Concert held in the Netherlands. Cronkite routinely hosted the Kennedy Center Honors from 1981 to 2002. Cronkite appeared briefly in the 2005 dramatic documentary The American Ruling Class written by Lewis Lapham; the 2000 film Thirteen Days reporting on the Cuban Missile Crisis; and provided the opening synopsis of the American Space Program leading to the events in Apollo 13 for the Ron Howard film of the same name. Cronkite wrote a syndicated opinion column for King Features Syndicate. In 2005 and 2006, he contributed to The Huffington Post. Cronkite was the honorary chairman of The Interfaith Alliance. In 2006, he presented the Walter Cronkite Faith and Freedom Award to actor and activist George Clooney on behalf of his organization at its annual dinner in New York. Cronkite was a vocal advocate for free airtime for political candidates. He worked with the Alliance for Better Campaigns and Common Cause, for instance, on an unsuccessful lobbying effort to have an amendment added to the McCain-Feingold-Shays-Meehan Campaign Finance Reform Act of 2001 that would have required TV broadcast companies to provide free airtime to candidates. Cronkite criticized the present system of campaign finance which allows elections to "be purchased" by special interests, and he noted that all the European democracies "provide their candidates with extensive free airtime." "In fact," Cronkite pointed out, "of all the major nations worldwide that profess to have democracies, only seven – just seven – do not offer free airtime" This put the United States on a list with Ecuador, Honduras, Malaysia, Taiwan, Tanzania, and Trinidad and Tobago. Cronkite concluded that "The failure to give free airtime for our political campaigns endangers our democracy." During the elections held in 2000, the amount spent by candidates in the major TV markets approached $1 billion. "What our campaign asks is that the television industry yield just a tiny percentage of that windfall, less than 1 percent, to fund free airtime." He was a member of the Constitution Project's bipartisan Liberty and Security Committee. He also supported the nonprofit world hunger organization Heifer International. It seems to many of us that if we are to avoid the eventual catastrophic world conflict we must strengthen the United Nations as a first step toward a world government patterned after our own government with a legislature, executive and judiciary, and police to enforce its international laws and keep the peace. To do that, of course, we Americans will have to yield up some of our sovereignty. That would be a bitter pill. It would take a lot of courage, a lot of faith in the new order. But the American colonies did it once and brought forth one of the most nearly perfect unions the world has ever seen. Even as with the American rejection of the League of Nations, our failure to live up to our obligations to the United Nations is led by a handful of willful senators who choose to pursue their narrow, selfish political objectives at the cost of our nation's conscience. They pander to and are supported by the Christian Coalition and the rest of the religious right wing. Their leader, Pat Robertson, has written that we should have a world government but only when the messiah arrives. Any attempt to achieve world order before that time must be the work of the Devil! Well join me... I'm glad to sit here at the right hand of Satan. In 2003, Cronkite, who owned property on Martha's Vineyard, became involved in a long-running debate over his opposition to the construction of a wind farm in that area. In his column, he repeatedly condemned President George W. Bush and the 2003 invasion of Iraq. Cronkite appeared in the 2004 Robert Greenwald film Outfoxed, where he offered commentary on what he said were unethical and overtly political practices at the Fox News Channel. Cronkite remarked that when Fox News was founded by Rupert Murdoch, "it was intended to be a conservative organization – beyond that; a far-right-wing organization". In January 2006, during a press conference to promote the PBS documentary about his career, Cronkite said that he felt the same way about America's presence in Iraq as he had about their presence in Vietnam in 1968 and that he felt America should recall its troops. Cronkite spoke out against the War on Drugs in support of the Drug Policy Alliance, writing a fundraising letter and appearing in advertisements on behalf of the DPA. In the letter, Cronkite wrote: "Today, our nation is fighting two wars: one abroad and one at home. While the war in Iraq is in the headlines, the other war is still being fought on our own streets. Its casualties are the wasted lives of our own citizens. I am speaking of the war on drugs. And I cannot help but wonder how many more lives, and how much more money, will be wasted before another Robert McNamara admits what is plain for all to see: the war on drugs is a failure." 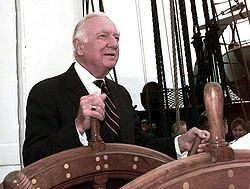 Cronkite at the helm of the USS Constitution in July 1997. Cronkite was married for nearly 65 years to Mary Elizabeth 'Betsy' Maxwell Cronkite, from March 30, 1940, until her death from cancer on March 15, 2005. They had three children: Nancy Cronkite, Mary Kathleen (Kathy) Cronkite, and Walter Leland (Chip) Cronkite III (who is married to actress Deborah Rush). Cronkite dated singer Joanna Simon from 2005 to 2009[better source needed] A grandson, Walter Cronkite IV, now works at CBS. Cronkite's cousin is former Mayor of Kansas City and 2008 Democratic nominee for Missouri's 6th congressional district Kay Barnes. Cronkite was an accomplished sailor and enjoyed sailing coastal waters of the United States in his custom-built 48-foot Sunward "WYNTJE". Cronkite was a member of the United States Coast Guard Auxiliary, with the honorary rank of commodore. Throughout the 1950s, he was an aspiring sports car racer, even racing in the 1959 12 Hours of Sebring. Cronkite was reported to be a fan of the game Diplomacy, which was John F. Kennedy and Henry Kissinger's favorite game. In June 2009, Cronkite was reported to be terminally ill. He died on July 17, 2009, at his home in New York City, at the age of 92. He is believed to have died from cerebrovascular disease. Cronkite's funeral took place on July 23, 2009, at St. Bartholomew's Church in midtown Manhattan, New York City. At his funeral, his friends noted his love of music, including, recently, drumming. For many years, until a decade after he left his post as anchor, Cronkite was considered one of the most trusted figures in the United States. For most of his 19 years as anchor, he was the "predominant news voice in America." Affectionately known as "Uncle Walter," he covered many of the important news events of the era so effectively that his image and voice are closely associated with the Cuban Missile Crisis, the assassination of President John F. Kennedy, the Vietnam War, the Apollo 11 Moon landing, and the Watergate scandal. USA Today wrote that "few TV figures have ever had as much power as Cronkite did at his height." Enjoying the cult of personality surrounding Cronkite in those years, CBS allowed some good-natured fun-poking at its star anchorman in some episodes of the network's popular situation comedy All in the Family, during which the lead character Archie Bunker would sometimes complain about the newsman, calling him "Pinko Cronkite." Cronkite trained himself to speak at a rate of 124 words per minute in his newscasts, so that viewers could clearly understand him. In contrast, Americans average about 165 words per minute, and fast, difficult-to-understand talkers speak close to 200 words per minute. In 1968, the faculty of the E. W. Scripps School of Journalism at Ohio University voted to award Cronkite the Carr Van Anda Award "for enduring contributions to journalism." In 1970, Cronkite received a "Freedom of the Press" George Polk Award and the Paul White Award from the Radio Television Digital News Association. In 1972, in recognition of his career, Princeton University's American Whig-Cliosophic Society awarded Cronkite the James Madison Award for Distinguished Public Service. In 1981, the year he retired, former president Jimmy Carter awarded Cronkite the Presidential Medal of Freedom. In that year, he also received the S. Roger Horchow Award for Greatest Public Service by a Private Citizen, an award given out annually by Jefferson Awards, and the Paul White Award for lifetime achievement from the Radio Television Digital News Association. In 1985, Cronkite was honored with the induction into the Academy of Television Arts and Sciences Hall of Fame. In 1989 he received the Four Freedoms Award for the Freedom of Speech In 1995, he received the Ischia International Journalism Award. In 1999, Cronkite received the Rotary National Award for Space Achievement's Corona Award in recognition of a lifetime of achievement in space exploration. He was elected a Fellow of the American Academy of Arts and Sciences in 2003. On March 1, 2006, Cronkite became the first non-astronaut to receive NASA's Ambassador of Exploration Award. Among Cronkite's numerous awards were four Peabody awards for excellence in broadcasting. In 2003, Cronkite was honored by the Vienna Philharmonic with the Franz Schalk Gold Medal, in view of his contributions to the New Year's Concert and the cultural image of Austria. A few years after Cronkite retired, Tom Chauncey, an owner of KTSP-TV, the then-CBS affiliate in Phoenix, contacted Cronkite, an old friend, and asked him if he would be willing to have the journalism school at Arizona State University named after him. Cronkite immediately agreed. The ASU program acquired status and respect from its namesake. Cronkite was not just a namesake, but he also took the time to interact with the students and staff of the Walter Cronkite School of Journalism and Mass Communication. Cronkite made the trip to Arizona annually to present the Walter Cronkite Award for Excellence in Journalism to a leader in the field of media. "The values that Mr. Cronkite embodies – excellence, integrity, accuracy, fairness, objectivity – we try to instill in our students each and every day. There is no better role model for our faculty or our students," said Dean Christopher Callahan. The school, with approximately 1,700 students, is widely regarded as one of the top journalism schools in the country. It is housed in a new facility in downtown Phoenix that is equipped with 14 digital newsrooms and computer labs, two TV studios, 280 digital student work stations, the Cronkite Theater, the First Amendment Forum, and new technology. The school's students regularly finish at the top of national collegiate journalism competitions, such as the Hearst Journalism Awards program and the Society of Professional Journalists Mark of Excellence Awards. In 2009, students won the Robert F. Kennedy Journalism Award for college print reporting. In 2008, the state-of-the-art journalism education complex in the heart of ASU's Downtown Phoenix campus was also built in his honor. The Walter Cronkite Regents Chair in Communication seats the Texas College of Communications dean. The Walter Cronkite papers are preserved at the curatorial Dolph Briscoe Center for American History at the University of Texas at Austin. Occupying 293 linear feet (almost 90 metres) of shelf space, the papers document Cronkite's journalism career. Amongst the collected material are Cronkite's early beginnings while he still lived in Houston. They encompass his coverage of World War II as a United Press International correspondent, where he cemented his reputation by taking on hazardous overseas assignments. During this time he also covered the Nuremberg war crimes trial serving as the chief of the United Press bureau in Moscow. The main content of the papers documents Cronkite's career with CBS News between 1950 and 1981. The Cronkite Papers assemble a variety of interviews with U.S. presidents, including Herbert Hoover, Harry Truman, and Ronald Reagan. President Lyndon Johnson requested a special interview with Cronkite while he was broadcasting live on CBS. Between 1990 and 1993, Don Carleton, executive director for the Center for American History, assisted Cronkite as he compiled an oral history to write his autobiography, A Reporter's Life, which was published in 1996. The taped memoirs became an integral part of an eight-part television series Cronkite Remembers, which was shown on the Discovery Channel. As a newsman, Cronkite devoted his attention to the early days of the space program, and the "space race" between the United States and the Soviet Union. The National Aeronautics and Space Administration honored Cronkite on February 28, 2006. Michael Coats, director of NASA's Lyndon B. Johnson Space Center in Houston, presented Cronkite with the Ambassador of Exploration Award. Cronkite was the first non-astronaut thus honored. NASA presented Cronkite with a moon rock sample from the early Apollo expeditions spanning 1969 to 1972. Cronkite passed on the moon rock to Bill Powers, president of the University of Texas at Austin, and it became part of the collection at the Dolph Briscoe Center for American History. Carleton said at this occasion, "We are deeply honored by Walter Cronkite's decision to entrust this prestigious award to the Center for American History. The Center already serves as the proud steward of his professional and personal papers, which include his coverage of the space program for CBS News. It is especially fitting that the archive documenting Walter's distinguished career should also include one of the moon rocks that the heroic astronauts of the Apollo program brought to Earth." On November 4, 2013, Missouri Western State University in St. Joseph, Missouri dedicated the Walter Cronkite Memorial. The nearly 6,000 square-foot memorial includes images, videos and memorabilia from Cronkite's life and the many events he covered as a journalist. The memorial includes a replica of the newsroom from which Cronkite broadcast the news during the 1960s and 1970s. In 2014, the Memorial received the Missouri Division of Tourism's Spotlight Award. Cronkite, Walter (1996). A Reporter's Life. New York: Alfred A. Knopf. ISBN 0-394-57879-1. ^ a b Ben Zimmer (July 31, 2009). "Too Good to Check". On the Media (Interview: audio/transcript). Interviewed by Bob Garfield. NPR. Archived from the original on August 4, 2009. Retrieved August 2, 2009. ^ "CBS at 75 Timeline — The 1950s". Archived from the original on May 5, 2006. Retrieved April 26, 2006. ^ Cook, Jeff Scott (1989). The elements of speechwriting and public speaking. Macmillan. p. 171. ISBN 0-02-527791-X. ^ a b c d e f g Winfrey, Lee; Schaffer, Michael D. (July 17, 2009). "Walter Cronkite dies". The Philadelphia Inquirer. Retrieved July 18, 2009. ^ a b "Cronkite honored by NASA for space coverage". USA Today. February 26, 2006. Retrieved August 2, 2012. ^ CNN, By Tom Watkins. "How 'That's the way it is' became Cronkite's tag line - CNN.com". www.cnn.com. Retrieved May 23, 2018. ^ a b c d e f g h i j k l Barron, David (July 17, 2009). "News icon Walter Cronkite dies at 92". Houston Chronicle. Retrieved July 17, 2009. ^ a b c d e f g h i "Former CBS News Anchor Walter Cronkite Dies". WorldNow and Sarkes Tarzian, Inc. KTVN Channel 2. July 17, 2009. Retrieved July 18, 2009. ^ a b c d e f g h i Barnhart, Aaron (July 17, 2009). "How Missouri native became 'most trusted man in America'". McClatchy. Retrieved August 2, 2012. ^ "Walter Cronkite Biography (1916–2009)". Film Reference. Retrieved July 17, 2009. ^ Meeks, Flori (May 6, 2014). "Switch to Montessori proved pivotal for Wilson school". Heights Examiner at the Houston Chronicle. Retrieved March 11, 2017. ^ a b c Cronkite, Walter (December 4, 2009). "Cronkite's Texas: A Q&A with Walter Cronkite". UTNews (Interview). Interviewed by Don Carleton. Austin, Texas, U.S.: University of Texas at Austin. Retrieved November 4, 2016. 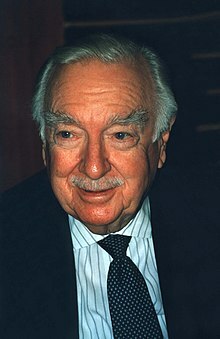 ^ a b c d e "CBS Legend Walter Cronkite Dies "Most Trusted Man in America" Passes Away in New York at 92". CBS News. July 17, 2009. Retrieved July 17, 2009. ^ Fenster, Bob (2005). The Duh Awards: In This Stupid World, We Take the Prize. Andrews McMeel Publishing. p. 176. ISBN 0-7407-5021-6. ^ Sperber, A. M. (1998). Murrow, His Life and Times. Fordham University Press. p. 228. ISBN 0-8232-1881-3. ^ Gay, Timothy M (2013). Assignment to Hell: The War Against Nazi Germany with Correspondents Walter Cronkite, Andy Rooney, A.J. Liebling, Homer Bigart, and Hal Boyle. NAL Caliber Trade. ISBN 0-451-41715-1. ^ Cronkite 1996, p. 89–90. ^ "USS Texas (BB-35)". Historic Naval Ships Visitors Guide. Historic Naval Ships Association. Archived from the original on September 5, 2006. Retrieved December 29, 2006. ^ Auster, Albert (2008). "Cronkite, Walter U.S. Broadcast Journalist". The Museum of Broadcast Communications (museum.tv). Archived from the original on March 25, 2009. Retrieved July 20, 2009. ^ Ferguson, Billy G. (2003). Unipress: United Press International covering the 20th century. Fulcrum Publications. p. 141. Retrieved August 5, 2012. ^ Erlich, Reese. "Walter Cronkite Remembers". The Russia Project. Retrieved August 5, 2012. ^ a b Martin, Douglas (July 17, 2009). "Walter Cronkite, 92, Dies; Trusted Voice of TV". The New York Times. Retrieved August 2, 2009. ^ "Cronkite with Charlemane the Lion on CBS' The Morning Show (photograph)". CBS News. June 23, 2006. Retrieved August 2, 2009. ^ Sandomir, Richard (July 19, 2009). "Amid Blizzard, Cronkite Helped Make Sports History". The New York Times. Retrieved August 2, 2009. ^ a b Sneed, Tierney (November 14, 2013). "How John F. Kennedy's Assassination Changed Television Forever". U.S. News & World Report. Archived from the original on August 20, 2017. Retrieved August 20, 2017. ^ CBS News Transcripts, January 16, 1980. ^ Goodman, Ellen (June 17, 1980). "And That's the Way It Is – Or Is It?". The Washington Post. Retrieved July 18, 2009. ^ Daniel, Douglass K. (2007). Harry Reasoner: a life in the news (digitised online by Google Books online). University of Texas Press. pp. 87, 88. ISBN 978-0-292-71477-9. ^ a b c d Secrets of the Dead season 13, episode 1: "JFK: One PM Central Standard Time". Produced by WNET, premiered November 13, 2013 on PBS. ^ Morrow, Robert D. (1993). First Hand Knowledge: How I Participated in the CIA-Mafia Murder of President Kennedy (digitised online by Google Books online). SP Books. ISBN 978-1-56171-274-8. ^ a b c d "Cronkite broadcasts: Moon landing, JFK death". MSNBC. July 17, 2009. Retrieved October 6, 2010. ^ a b c "JFK Assassination (CBS Coverage) – Part 8/10 (1963)". CBS News. November 22, 1963. Retrieved August 2, 2012. ^ Taylor, Alan (2009). "'Walter was more than just an anchor. He was family' Obama pays tribute after death of TV legend Cronkite". Sunday Herald. Retrieved August 14, 2012. ^ "Remembering Walter Cronkite That's the Way it Was: The World of Politics, News and Entertainment Remember a Broadcasting Legend and American Icon". CBS News. July 19, 2009. Retrieved July 18, 2009. ^ a b Fromson, Murray (July 21, 2009). "And That's The Way It Was..." Huffington Post. Retrieved December 4, 2009. ^ "Who, What, When, Where, Why: Report from Vietnam by Walter Cronkite,". CBS Evening News. February 27, 1968. Retrieved August 3, 2012. ^ Moore, Frazier (July 18, 2009). "Legendary CBS anchor Walter Cronkite dies at 92". GMA News. Associated Press. Retrieved August 3, 2012. ^ Wicker, Tom (January 26, 1997). "Broadcast News". The New York Times. Retrieved May 1, 2009. ^ Braestrup, Peter (1994). Big Story. Presidio Press. ISBN 978-0891415312. ^ Campbell, W. Joseph (2010). Getting It Wrong: Ten of the Greatest Misreported Stories in American Journalism. University of California Press. ISBN 978-0-520-25566-1. ^ a b c Campbell, W. Joseph (July 9, 2012). "Chris Matthews invokes the 'if I've lost Cronkite' myth in NYT review". Retrieved August 3, 2012. ^ a b Bob Schieffer (January 6, 2004). This Just In: What I Couldn't Tell You on TV. Putnam Pub Group. ISBN 978-0-399-14971-9. Retrieved June 8, 2013. ^ Walter Cronkite (1996). A Reporter's Life (1st ed.). Ballantine Books. p. 256. ISBN 978-0-394-57879-8. ^ "The Unmaking of the President". smithsonianmag.com. ^ "Behind L.B.J. 's Decision Not to Run in '68". The New York Times. April 16, 1988. ^ a b c d e f g Walter Cronkite (July 18, 2009). "From The Archives: Cronkite, Live Via Satellite". NPR. Retrieved July 23, 2009. ^ Walter Cronkite (July 23, 2002). "The Day the World Got Smaller". NPR All Things Considered (full audio segment). Retrieved July 23, 2009. ^ "Vanderbilt Television News Archive". CBS Evening News for Monday, Jan 22, 1973. Vanderbilt University Television News Archive. January 22, 1973. Retrieved July 18, 2009. ^ "Walter Cronkite announces the death of LBJ 1973". CBS. January 22, 1973. Retrieved August 3, 2012. ^ Martin Lewis (July 19, 2009). "Tweet The Beatles! How Walter Cronkite Sent The Beatles Viral... in 1963!". The Huffington Post. Retrieved June 7, 2010. ^ Walter Cronkite at museum.tv Archived September 23, 2006, at the Wayback Machine. ^ Murray, Michael D. (1999). Encyclopedia of television news (illustrated ed.). Greenwood Publishing Group. p. 35. ISBN 978-1-57356-108-2. ^ Cronkite, Walter (March 6, 1981). ""And that's the way it is": Walter Cronkite's final sign off". CBS. Retrieved September 7, 2016. ^ Lloyd Wynn (January 21, 2018). "Johnny Carson Plays Walter Cronkite" – via YouTube. ^ RockfrdDrm (August 27, 2013). "Johnny Carson Plays Walter Cronkite" – via YouTube. ^ "TV Interview for Granada World in Action". Margaret Thatcher Foundation. 2009. Retrieved July 20, 2009. ^ "From Vienna: The New Year's Celebration 2009". Educational Broadcasting Corporation. December 9, 2008. Retrieved July 18, 2009. ^ "YouTube – Walter Cronkite and Ben Bradlee". YouTube. 2009. Retrieved July 20, 2009. ^ "Giving to UT: Philanthropy at the University of Texas". Office of the Vice President for Development. University of Texas. 1997–2009. Archived from the original on December 2, 2002. Retrieved July 20, 2009. ^ "Aging – BrainPOP". brainpop.com. ^ "ARRL :: Videos :: Amateur Radio Today (DVD)". arrl.org. ^ "Chatham Marconi Maritime Center". Chatham Marconi Maritime Center. 2008. Retrieved July 20, 2009. ^ "Legacy of War – Legacy of War Spoilers, Episode Guides, Message Board". TV Guide. Retrieved July 18, 2009. ^ "Walter Cronkite". Huffington Post. July 20, 2009. Retrieved July 20, 2009. ^ Message From Walter Cronkite, The Interfaith Alliance. Retrieved August 3, 2012. ^ "9th Annual Walter Cronkite Faith & Freedom Award Gala". The Interfaith Alliance. November 1, 2006. Archived from the original on April 15, 2007. Retrieved July 20, 2009. ^ a b c d Cronkite, Walter (November 4, 2002). "Free the Air Waves!". Citizens Union Foundation. Gotham Gazette. ^ "The Constitution Project: Bipartisan Committee Denounces Illegal Spying Program". Common Dreams.org. 1997–2009. Archived from the original on July 25, 2009. Retrieved July 20, 2009. ^ a b "A speech by Walter Cronkite – United Nations, national sovereignty and the future of the world". Upon receiving the Norman Cousins Global Governance Award, on October 19, 1999, at the UN Delegates Dining Room in New York City. Renew America. 1999. Retrieved July 18, 2009. ^ a b Cronkite, Walter (1999). "ASI presents: Hillary, Walter Cronkite and World Government". Retrieved August 3, 2012. ^ Cabrera, Luis. Political theory of global justice (digitised online by Google Books online). Routledge Taylor and Francis Group. p. 166. Originally quoted for this book in Walter Cronkite. "The Case for Democratic World Government." Earth Island Journal. Vol. 15, no. 2. Summer 2000. p. 45. ^ "Cronkite: Time for U.S. to Leave Iraq". San Francisco Chronicle. Archived from the original on October 2, 2008. Retrieved April 26, 2006. ^ a b Cronkite, Walter (2006). "Why I Support DPA, and So Should You". Drug Policy Alliance. Archived from the original on March 4, 2006. Retrieved July 17, 2009. ^ Reuters. "Legendary TV news anchor Walter Cronkite dies". abs-cbnnews.com. ^ "Social Security Death Index". Ancestry.com. 2009. Retrieved July 20, 2009. .
^ 17, Carol Ross Joynt on May; 2013 (May 17, 2013). "Walt Cronkite's Party for His Book About His Grandfather, Walter Cronkite". washingtonian.com. ^ "USCG: Frequently Asked Questions". Walter Cronkite. U.S. Department of Homeland Security. July 22, 2008. Retrieved July 20, 2009. ^ a b "Friends Recall Walter Cronkite’s Private Side", Brian Stelter, The New York Times, July 23, 2009. ^ Garrett, Jerry (July 20, 2009). "Walter Cronkite, the Race Car Driver – Wheels Blog – NYTimes.com". The New York Times. Retrieved July 20, 2009. ^ McClellan, Joseph. "Lying and Cheating by the Rules," The Washington Post, June 2, 1986. ^ Moore, Frazier (June 19, 2009). "Veteran CBS newsman Walter Cronkite reported ill". USA Today. Retrieved August 3, 2012. ^ a b Ryan, Joal (July 17, 2009). "News Legend Walter Cronkite Dead at 92". e online. Retrieved July 17, 2009. ^ Stelter, Brian (July 17, 2009). "Walter Cronkite, Iconic Anchorman Dies". Media Coder. Retrieved July 17, 2009. ^ "Former CBS News anchor Walter Cronkite dies". MSNBC. Associated Press. July 19, 2009. Retrieved July 20, 2009. ^ "Loved ones, colleagues honor Walter Cronkite". msn.com. July 23, 2009. ^ a b c Bianco, Robert (July 17, 2009). "Cronkite's passing: A death in everyone's family". USA Today. Retrieved July 18, 2009. ^ David Hinckley (July 18, 2009). "Walter Cronkite remains gold standard for journalists". New York Daily News. Retrieved July 18, 2009. ^ Statement from audiologist Ray Hull, PhD, ray.hull@wichita.edu, quoted in "Home Make-Over: How to design an efficient listening environment" by Alyssa Banotai, ADVANCE For Speech-Language Pathologists and Audiologists (April 16, 2007), p. 8. ^ E.W. Scripps School of Journalism. ^ a b "Paul White Award". Radio Television Digital News Association. Retrieved May 27, 2014. ^ "National – Jefferson Awards Foundation". jeffersonawards.org. ^ "Premio Ischia Roll of Honour". Archived from the original on July 5, 2010. Retrieved May 9, 2011. ^ Marianne Dyson (March 12, 1999). "1999 Corona Award Recipient". Retrieved April 19, 2011. ^ "Book of Members, 1780–2010: Chapter C" (PDF). American Academy of Arts and Sciences. Retrieved April 22, 2011. ^ "Newsman Walter Cronkite to be honored by NASA for his coverage of America's space program". The Dolph Briscoe Center for American History. University of Texas at Austin. 2008. Retrieved July 17, 2009. ^ "Philharmonic Journal : Walter Cronkite awarded the Franz Schalk Medal in Gold". Wiener Philharmoniker. ^ a b "Walter Cronkite and ASU". The Walter Cronkite School of Journalism and Mass Communication. Retrieved July 18, 2009. ^ "Walter Cronkite School of Journalism and Mass Communication". Walter Cronkite Biography. ASU Walter Cronkite School of Journalism and Mass Communication. Retrieved July 17, 2009. ^ "In Memoriam: Walter Cronkite, 1916–2009", Center for American History. Retrieved 2009-07-31. ^ a b "News Media History – Walter Cronkite The Walter Cronkite Papers". The Dolph Briscoe Center for American History. University of Texas at Austin. 2006–2008. Retrieved July 18, 2009. ^ "Walter Cronkite on Apollo 11 Moon Landing". The Inspiration Room. Retrieved July 18, 2009. ^ "NASA Honors Veteran Journalist Walter Cronkite". NASA. February 28, 2006. Retrieved July 18, 2009. ^ Patch, Justin (June 8, 2009). "Apollo 11 moon rock named for Cronkite on display at UT Texas Memorial Museum". Daily Texan. Archived from the original on May 29, 2007. Retrieved July 20, 2009. ^ "Newsman Walter Cronkite to be honored by NASA". University of Texas at Austin: Office of Public Affairs. Infinite Now. February 3, 2006. Archived from the original on July 25, 2009. Retrieved July 18, 2009. ^ Weston, Alonzo (November 4, 2013). "Western dedicates Cronkite memorial". St. Joseph News-Press. Retrieved March 4, 2016. ^ "Walter Cronkite Memorial". Retrieved March 4, 2016. ^ Waltz, Adam (November 9, 2015). "New piece of Cronkite display opens". St. Joseph News-Press. Retrieved March 4, 2016. ^ "Walter Cronkite Memorial receives state tourism award". KQTV. St. Joseph, Missouri. October 10, 2014. Archived from the original on April 20, 2016. Retrieved March 4, 2016. Cronkite, Walter (1971). Eye on the World. New York: Cowles Book Company. ASIN B007RCFWFM. Brinkley, Douglas (2012). Cronkite. New York: Harper. ISBN 0-06-137426-1.